Open Access Journal: Textual Criticism of Persian Literature. "The aim of the journal is to promote Persian literary texts and acquaint researchers with studies in the fields of commentary on Persian literary texts, explanation of difficult points in Persian literary texts, critical analysis of corrections of manuscripts, introducing and explaining manuscripts, aesthetic analysis of Persian literary texts and analysis of Persian literary texts via modern literary theories. The language of the journal is Persian and all submissions should be in this language. All procedures of submission, refereeing and announcement are done online and via the site of the journal. All submissions are blindly refereed by at least two experts." In Persian; abstracts in Persian and English. "The Maps and Cartography section contains two kind of documents: original maps of Jerusalem reproduced here as a tool for researchers, and links to existing sets of Jerusalem maps—both historical and contemporary. Riwaq’s Jerusalem Maps: The current stock that opens the collection contains five maps based on a ten-year survey of the old city undertaken by Riwaq: The Centre for Architectural Conservation. It contains a historical map identifying the evolution of sites according to the historic era (Roman, Byzantine, Umayyad, Fatimid, Ottoman, etc. ), as well as markers identifying the condition, nature, size of buildings and residency in the walled city. Those maps can be downloaded and used by researchers provided source reference is identified. (Copyright Riwaq: Bireh, Palestine)—Higher resolution images are available from the Centre directly." 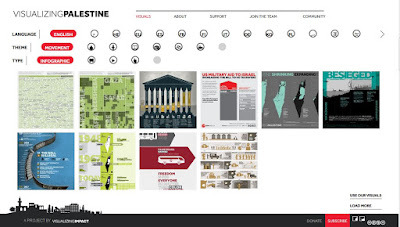 "Visualizing Palestine creates data-driven tools to advance a factual, rights-based narrative of the Palestinian-Israeli issue. Our researchers, designers, technologists, and communications specialists work in partnership with civil society actors to amplify their impact and promote justice and equality." 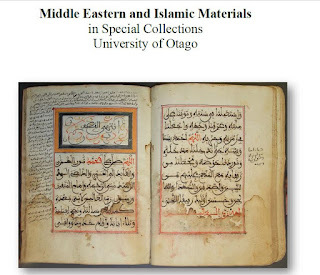 An inventory of Middle Eastern and Islamic Materials in Special Collections at the University of Otago, Dunedin, New Zealand. Abjad Calculator - tool for calculating the numerical abjad value of a string of Arabic or Persian text. 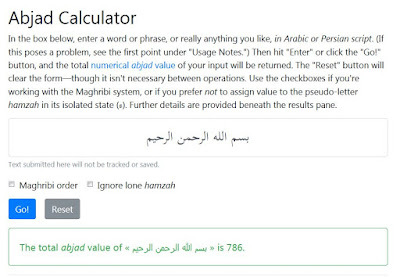 Abjad Calculator is web tool for calculating the numerical abjad value of a string of Arabic or Persian text. It was developed by Theo Beers , PhD candidate, University of Chicago. Author: Center on American Muslim Philanthropy. 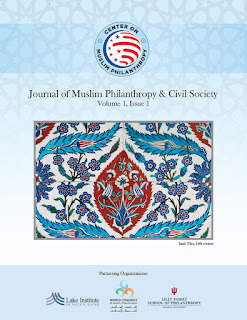 "The Journal of Muslim Philanthropy & Civil Society (JMPCS), is a bi-annual, peer reviewed, open access journal published by the Center on Muslim Philanthropy in partnership with the IUPUI University Library Center for Digital Scholarship, and the Lilly Family School of Philanthropy at Indiana University. JMPCS seeks original academic research examining the broad scope of Muslim philanthropy and civil society. This peer reviewed online academic journal will publish research related to Muslim nonprofit, philanthropic and voluntary action. The terms “Muslim” and “philanthropy” are defined broadly to be inclusive of cutting-edge research from across the world and disciplines. JMPCS is intended to shed light on the dynamic practice and understanding of Muslim Philanthropy. We seek to draw articles by researchers from across disciplines (History, Political Science, Religious Studies, Sociology, Public Affairs, Nonprofit Management, Business, Philanthropy etc.) and practitioners throughout the world working in this emerging field." The first issue of Orientalia Suecana appeared in 1952. Its founder was Erik Gren (1904–1959), Reader in Classical History and Archaeology at Uppsala University and librarian at the University Library. 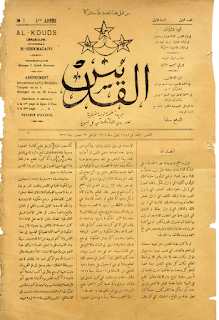 The journal succeed to the journal Le Monde Oriental, published in Uppsala in years 1906–1946. Most of the contributions in the early volumes were primarily philological, with a wider view towards historical, and especially religious-historical issues. More recently, besides the articles dealing with antiquity, Orientalia Suecana has published numerous studies on present-day topics and phenomena. While maintaining its philological focus on texts, the journal is open to linguistic and literary researches in the fields of Semitic, Iranian, Turkic, Indic, and Chinese studies. Orientalia Suecana is a peer-reviewed yearbook. Manuscripts submitted to Orientalia Suecana normally are sent to two readers, one of whom may be a member of the journal’s editorial board. Reviewers evaluate the paper based on such criteria as the importance of the topic, the originality of the research, the methodology of the author(s), and the quality and clarity of the writing. The reviewers recommend to the editors whether the paper should be accepted substantially as is, accepted with modifications, returned for rewriting and a second round of reviews, or rejected. Ultimately, it is the responsibility of the editors to decide whether to accept or reject a paper. It is understood that acceptance of a manuscript is conditional until the editors consider the paper ready for publication and explicitly communicate this to the author. Abstract : A primary source on a journey to Persia by Captain John Compton Pyne in 1884 revealing the West’s fascination with the Middle East in Victorian times. The book includes an introduction by the editors and a transcription of the manuscript with notes and the original illustrations, mainly watercolours. 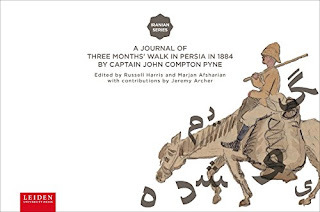 An important historical document and eye-witness account pertaining to Iran, anthropology, area studies, study of ‘orientalism’ and colonialism, and for historians. Byzantium and the Arabs in the Sixth Century, volume 1, part 1, Political and Military History is devoted to the main Arabian tribes that federates of the Byzantine Roman Empire. In the early sixth century Constantinople shifted its Arab alliance from the Salahids to the Kindites and especially the Ghassanids, who came to dominate Arab-Byzantine relations through the reign of Heraclius. Arranged chronologically, this study, the first in-depth account of the Ghassanids since the nineteenth century, draws widely from original sources in Greek, Syriac, and Arabic. Irfan Shahîd traces in detail the vicissitudes of the relationship between the Romans and the Ghassanids, and argues for the latter’s extensive role in the defense of the Byzantine Empire in its east. Byzantium and the Arabs in the Sixth Century, volume 1 part 2, Ecclesiastical History provides a chronologically ordered account of the involvement of the Ghassanids in ecclesiastical affairs in the eastern region of the Byzantine Empire. Tracing the role of Arab tribes both inside and outside the Roman limes, Irfan Shahîd documents how the Ghassanids in particular came to establish and develop a distinct non-Chalcedonian church hierarchy, all the while remaining allies of the Chalcedonian emperors. Ghassanid phylarchs such as Mundir emerge not merely as loyal foederati but devout Christians. Shahîd extensively and critically analyzes the Greek, Syriac, and Arabic sources, including many obscure or unfamiliar texts to illuminate the religious landscape of the Arabs of the sixth century. Byzantium and the Arabs in the Sixth Century, volume 2, part 1, Toponymy, Monuments, Historical Geography, and Frontier Studies is a topical study of the military, religious, and civil structures of the Ghassanids. Irfan Shahîd’s detailed study of Arab buildings of the sixth century illuminates how Byzantine provincial art and architecture were adopted and adapted by the federate Arabs for their own use. As monuments of Christian architecture, these federate structures constitute the missing link in the development of Arab architecture in the region between the earlier pagan (Nabataean and Palmyrene) and later Muslim (Umayyad). Drawing from literary and material evidence, Shahîd argues that the Gassanids were not nomadic, as traditionally believed, but thoroughly sedentary both in their roots and in the late Roman frontier zone they inherited. The third of four volumes dedicated to the sixth century, this book extensively depends upon the previous two volumes (volume 1, part 1, Political and Military History; volume 1, part 2, Ecclesiastical History). Byzantium and the Arabs in the Sixth Century, volume 2, part 2, Economic, Social, and Cultural History is a topical study of Arab economic, social, and cultural history in the sixth century. Irfan Shahîd focuses on the economy of the Ghassanids and presents information on various trade routes and fairs. He reconstructs Ghassanid daily life by discussing topics as varied as music, food, medicine, the role of women, and horse racing. Shahîd concludes the volume with an examination of cultural life, including descriptions of urbanization, Arabic script, chivalry, and poetry. Throughout the volume, the author reveals the history of a fully developed and unique Christian-Arab culture. Shahîd exhaustively describes the society of the Ghassanids, and their contributions to the cultural environment that persisted in Oriens during the sixth century and continued into the Umayyad caliphate. Just as the Tanūkhids rose and fell as the principal Arab foederati of Byzantium in the fourth century, so too in the fifth did the Salīḥids. The century, practically terra incognita in the history of Arab-Byzantine relations, is explored by Irfan Shahîd, who recovers from the sources the political, military, ecclesiastical, and cultural history of the Arab foederati in Oriens and the Arabian Peninsula during this period. Unlike their predecessors or successors, the foederati of the fifth century lived in perfect harmony with Byzantium. Federate-imperial relations were smooth: the Arab horse reached as far as Pentapolis in the West and possibly took part in Leo’s expedition against the Vandals. They were staunchly orthodox and participated in two ecumenical councils, Ephesus and Chalcedon, where their voice was audible. But their more enduring contributions were cultural, and may be associated with Dāwūd (David), the Salīḥid king; Petrus, the bishop of the Parembole; and possibly also Elias, patriarch of Jerusalem (494–516), a Roman Arab. The federate culture gave impetus to the rise of the Arabic script, Arabic poetry, and a simple form of an Arabic liturgy—the foundation for cultural achievements in subsequent centuries. The fourth century, the century of Constantine, witnessed the foundation and rise of a new relationship between the Roman Empire and the Arabs. The warrior Arab groups in Oriens became foederati, allies of Byzantium, the Christian Roman empire, and so they remained until the Arab conquests. In Byzantium and the Arabs in the Fourth Century, Irfan Shahîd elucidates the birth of the new federate existence and the rise of its institutional forms and examines the various constituents of federate cultural life: the phylarchate, the episcopate, the beginnings of an Arab Church, an Arabic liturgy, and the earliest attested composition of Arabic poetry. He discusses the participation of the Arab foederati in Byzantium’s wars with her neighbors—the Persians and the Goths—during which those Arab allies, most notably the Tanūkhids, contributed to the welfare of the imperium and the ecclesia. The Arab federate horse galloped for Byzantium as far as Ctesiphon, Constantinople, and possibly Najrân in Arabia Felix. In the reign of Valens, the foederati appeared as the defenders of Nicene Orthodoxy: their soldiers fought for it; their stern and uncompromising saint, Moses, championed it; and their heroic and romantic queen, Mavia, negotiated for it. The Arabs played an important role in Roman-controlled Oriens in the four centuries or so that elapsed from the Settlement of Pompey in 64 B.C. to the reign of Diocletian, A.D. 284–305. In Rome and the Arabs Irfan Shahîd explores this extensive but poorly known role and traces the phases of the Arab-Roman relationship, especially in the climactic third century, which witnessed the rise of many powerful Roman Arabs such as the Empresses of the Severan Dynasty, Emperor Philip, and the two rulers of Palmyra, Odenathus and Zenobia. Philip the Arab, the author argues, was the first Christian Roman emperor and Abgar the Great (ca. 200 A.D.) was the first Near Eastern ruler to adopt Christianity. In addition to political and military matters, the author also discusses Arab cultural contributions, pointing out the role of the Hellenized and Romanized Arabs in the urbanization of the region and in the progress of Christianity, particularly in Edessa under the Arab Abgarids. 1009 manuscripts digitized by Library of Congress from the set of microfilms. "As Jerusalem, the location of Christ’s Passion, has been central to the Christian religion since its inception, all the early churches sought a presence in that storied and holy city. 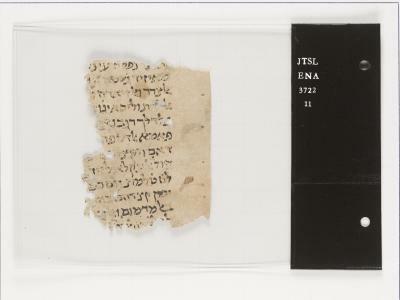 The Greek Orthodox Church and the Armenian Apostolic Church, for example, both maintain ancient patriarchates in Jerusalem and both have created renowned libraries in them..."
1694 manuscripts digitized by Library of Congress from the set of microfilms. "The renowned Eastern Orthodox Monastery of St. Catherine’s on Mt. Sinai was constructed by the Byzantine Emperor, Justinian I, in the late sixth century AD over the relics of the martyred saint and the place of the biblical burning bush as identified by St. Helena, the mother of the Roman Emperor, Constantine. It is home to reputedly the oldest continuously run library in existence today. Its holdings of religious and secular manuscripts are legendary and allegedly second only in number to the collection held by the Vatican: from bibles, to patristic works, to liturgies and prayers books, and on to legal documents such as deeds, court cases, Fatwahs (legal opinions). The greater proportion of the manuscripts were copied in Greek, and then in Syriac, Georgian, Coptic, Armenian, Arabic, Ottoman Turkish, and Ethiopic, as well as Old Church Slavonic..."
Katedra Arabistyki i Islamistyki Uniwersytetu Warszawskiego jest największym centrum badań w zakresie arabistyki i islamistyki w Polsce. Z początku arabistyka w Instytucie Orientalistycznym UW była połączona z pokrewnymi dziedzinami – turkologią i iranistyką. Dzięki staraniom J. Bielawskiego w 1964 roku została powołana Katedra Arabistyki, a co za tym idzie, arabistyka uzyskała samodzielny byt. Po licznych przekształceniach jednostka została ponownie przemianowana na Katedrę Arabistyki i Islamistyki w 2009 roku i obecnie jest jedną z trzech największych jednostek naukowych Wydziału Orientalistycznego UW. Przy Katedrze działa największa biblioteka arabistyczno-islamoznawcza w Polsce, która gromadzi publikacje nie tylko z zakresu arabistyki i islamistyki, ale również pokrewnych specjalizacji orientalistycznych oraz nauk pomocniczych. Katedra prowadzi studia w zakresie arabistyki i islamistyki. Nabór odbywa się rokrocznie, a od roku 2007/2008 wprowadzony został podział na studia pierwszego i drugiego stopnia. W następnym roku rozpoczęto również nabór na studia niestacjonarne (wieczorowe) pierwszego stopnia. W Katedrze Arabistyki i Islamistyki studiują także doktoranci Wydziału Orientalistycznego UW, którzy prowadzą badania literaturoznawcze oraz językoznawcze z zakresu arabistyki i islamistyki. The Article contains a biography and full bibliography of an eminent Egyptian scholar in the field of literature and linguistics, Šawqī Ḍayf. The bibliography of the works of Professor Krystyna Skarżyńska-Bocheńska. The bibliography of the works of Professor Danuta Madeyska. Volume in Honour of Prof. Krystyna Skarżyńska-Bocheńska and Prof. Danuta Madeyska, Department of Arabic and Islamic Studies, Faculty of Oriental Studies, University of Warsaw.